Discussion in 'Muppet Appearances' started by Phillip, Apr 13, 2012. Now that the once-in-a-lifetime performance of "Jim Henson's Musical World" at Carnegie Hall has happened, post here and let us know your thoughts on this special event where once again the numerous worlds of Jim Henson all came together: The Muppets, Sesame Street, Fraggle Rock and Emmet Otter. Fans can only hope that this special tribute will see a video or audio release in the months to come. If you were at Carnegie Hall, you can write an official review of "Jim Henson's Musical World" to be published on MuppetCentral.com. Please submit your review by Monday April 16. If you have pictures from the event that we can post on MuppetCentral.com with these reviews, please start a private conversation with me via the forum (or e-mail them to me). If you were at Carnegie Hall, please let us know by liking this discussion and give us your feedback below. We'd love to hear your thoughts on this amazing show. The New York Pops shared this great photo on Facebook of the Sesame Street cast members at rehearsals this week for the show on Saturday April 14. Henson also posted a picture of characters from Emmet Otter rehearsing as well. FrackleFan2012, jvcarroll and Zeliboba like this. The wonderful Matt Vogel posted the following Carnegie sneak peak pictures this morning on Twitter. Check them out and let us know your thoughts. Follow Matt on Twitter here. Rowlf the dog on the screen at Carnegie. Leslie Carrara-Rudolph posing on the stage at Carnegie. Matt Vogel's view from the stage. Great dinner tonight with the gang. Here's another video with some close up shots from the lower level. I just joined the forum so I could read other fans' reviews of the show. (I saw it today at 12:30pm). As I see no other reviews yet, I'll go ahead and give mine. Basically, it was *wonderful*!! Soooooo amazing! I laughed and cried from how happy I was. And thank you so much, Muppet Central - if I hadn't gotten an email about two weeks ago informing me about the concert, I never would have known! I bought one of the only tickets left, high up in the top balcony. But it was only $9! What an amazing deal, for what is likely the best show I have ever seen. For anyone who is interested, here is the rundown of what happened. Please don't read if you don't want the surprises spoiled! Then Rowlf introduced the conductor, Steven Reineke, who came out and said a little bit about Jim Henson. I should add that the large projection screen above the orchestra often reverted back to a lovely photo of Jim Henson, that was on most of the time when video clips weren't being shown. Hmm...my memory is a bit fuzzy now about the order of events of what happened next. But I think as Reineke was talking, we suddenly heard a commotion from one of the tiers of Carnegie Hall, and the audience turned and there were Statler & Waldorf, heckling the conductor. They said something about how glad they were that the Muppets weren't there. There was some back-and-forth, and then the orchestra began to play the Muppet Show theme song. At the center black screen, Rowlf disappeared and up came Dr. Teeth, and at the stage-left screen up came Floyd, Janis, and Zoot, and they played the theme song. Again, I had no idea so many Muppets would be appearing, so this was a wonderful surprise, seeing them play along with video clips from the show. Then the conductor tried to introduce the host, John Tartaglia, but he didn't appear. Finally the conductor pulled out his cell phone and called him. The screen showed a video of Tartaglia asleep in his bed, in rubber duckie pajamas. There was a bit about how he thought the show was still a week away, and when he realized the show was happening right then, he jumped out of bed and said "I'll be right there." A second later, he was coming up the center aisle, still in his pajamas, as the orchestra struck up the song "Sing" from Sesame Street. Here is where the only problem of the show began, and it was recurring, although never enough to really take away from my extreme enjoyment of the show -- numerous sound problems. Tartaglia's body mic wasn't working, so while he was struggling to get out of his pajamas (he had a tux underneath, a funny bit sort of dampened by his genuine difficulty removing the tear-away PJs), he was singing "Sing", but nobody could hear him. Then a techie ran on and handed him a hand-held mic, which he used for the remainder of the show. -Tartaglia and Fozzie talk about how Fozzie needs to go find the Muppets. Fozzie leaves. Argh. I'm not doing a good job, sorry. What happened next? Oh! I think while Fozzie is finding the others, Tartaglia asks the orchestra is anyone there has always wanted to be a star, because now's their chance. Up pops a violinist, who turns out to be Stephanie D'Abruzzo, Tartaglia's co-star in "Avenue Q". They do a song-and-dance number to "Stepping Out With a Star" from The Great Muppet Caper. It's very fun, and she leaves. Then.....hmm. Then. Sorry. There were just so many fun little sections, it's hard to keep them in order! I think then Uncle Traveling Matt popped up stage-right, as he was leading some Fraggles on a cave tour, and he thought Carnegie Hall was a cave. Up popped Red and Wembley, and they sang a medley of Fraggle Rock songs, some of which I didn't remember (I haven't seen the show since it originally aired in the 80s) and some I did ("Pass It On", and The Fraggle Rock Theme.) There was a huge chorus standing in the rear behind the orchestra, and when the "Dance your cares away" line happened, they all did the double-clap in unison, which was fun. 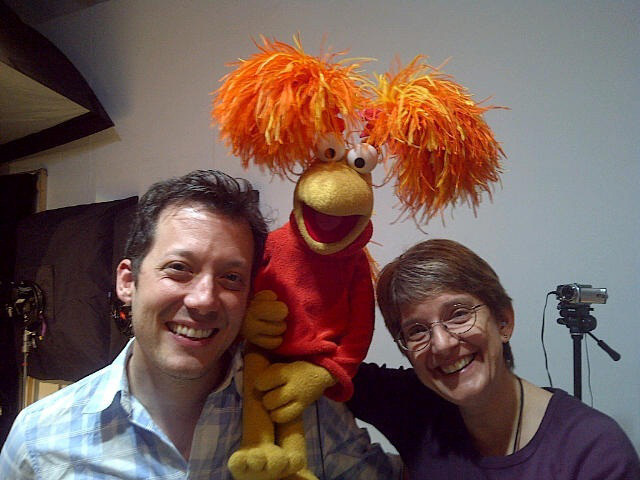 The Fraggles were great, really fun. And of course during their medley, there were video clips from Fraggle Rock being shown. When it was over, Tartaglia asked them if there was anyone in Fraggle Rock who was really all about music, and they mentioned Cantus the Minstrel, and then a photo was shown of Jim Henson operating that Fraggle. 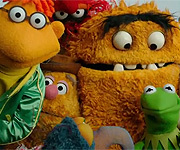 I should mention that since the theme of the show was music, there were many mentions of Jim Henson's love of music, and how he used it in all his projects. The Fraggles left, and then...oh, I think this is where Miss Piggy first showed up. She appeared stage left basically saying she had come "a week early" to re-do her dressing room. Tartaglia said it was time for her number, but she needed to do her hair, makeup, etc, and she left. Then Rachel Dratch appeared in the role of the Carnegie Hall Stage Manager, and they did a funny bit where she did her "impressions" of various Muppets, in case they didn't appear. Her impressions were terrible, hilariously so. She basically would say "Mmm...I like cookies!" in a very un-Cookie Monster-like voice, which she thought was dead on. It was very funny. Her bit was short, but got a lot of laughs. 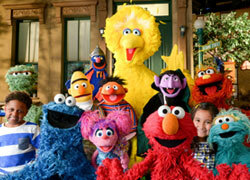 Then it was Sesame Street time! The band struck up the Sesame Street theme, and suddenly down the aisles came Bob, Maria, Gordon, Susan, and....others. Again, since I haven't seen the show much since my youth, I am at a loss to name the four (?) other actors that came on stage. I know Luis was not among them. There was an Asian-American man, a younger brunette, and a younger blonde. I apologize for not knowing their names. I recognized the Asian-American man from when I've flipped past the show here and there, I think maybe he now is the Mr. Hooper of the show? Anyway, they all were singing, and as they did, from stage right up popped Ernie, Bert, & Elmo! And from stage left, Cookie Monster! Again, seeing these childhood friends of mine live and in person, was just *wonderful! * I almost started to cry right then and there (which I did, later), out of sheer happiness! Tartaglia talked with them for a bit, then they all sang "Who Are the People In Your Neighborhood" (and the conductor begged to be part of the song, as he always wanted to be part of it, so Bob sang a verse about "A Conductor is a person in your neighborhood). Then the medley featured Ernie & Elmo singing "I have a mouth" (I doubt that's the title, but it's where Ernie lists the various parts of his face), then Cookie sang "C is for Cookie", then back to Ernie for "Rubber Duckie". I think there was one more, which was the big closer for the Sesame Street people, but I forget what it was. By the way, Cookie Monster definitely devoured a few cookies. When they all left, Tartaglia came down into the audience, asking for any Muppet memories. Before he got to anyone else, he "spotted" Paul Williams in the audience. Williams came up on stage, and Tartaglia sat in his seat and watched. Williams talked about his early days working with Jim Henson, and then mentioned how he was asked to write some songs for "Emmet Otter's Jug-Band Christmas." Out popped a few squirrels and....other creatures (I couldn't tell from my balcony seat), who sang "Barbecue" with him. Then the medley moved to "When The River Meets the Sea", one of my favorites. Suddenly I noticed on stage-left were Doc Bullfrog and Emmett Otter, singing along! That was really special, as I didn't know those puppets were even still around, or in service. The medley moved on to "Ain't No Hole in the Washtub" and ended with....with...hmm. Did it end with "Washtub"? I feel like there was one more, but maybe I'm making that up. "Our World", maybe? Aargh. Sorry, folks. Anyway, Williams left, and then Tartaglia re-appeared, noticing the Muppets had still not arrived. Fozzie showed up with a basket of muffins, which is what he thought Tartaglia has asked for. "Muppets! ", he corrected him. Fozzie felt very badly, saying he always gets things wrong. Tartaglia started singing “Just One Person” to cheer him up, and then up came Kermit to join in. Then Scooter, Gonzo, and even Beauregard. On the other side of the stage Dr. Bunsen Honeydew, Beaker, and....a few others I can’t remember now appeared too. They all sang together, and...well, it was just amazing, seeing all the Muppets on stage like that. So colorful! So many personalities I loved so much from my youth. A real highlight. Then they all left but Kermit, whose legs came up and over the screen, like in the old ‘talking with the celebrities’ sections of The Muppet Show. Tartaglia asked him to sing “Being Green”, which he did. Then...hmm. I can’t really remember exactly how it went from here, because I was completely tearing up at this point. Oh! Fozzie popped back up, and Kermit & Fozzie sang “Movin’ Right Along” from The Muppet Movie, which was great. At one point Kermit said “It brings back great memories, doesn’t it, Fozzie?” It sure did, for all of us. There was a huge standing ovation, and then it was over. It ran about an hour and ten minutes total. It could have easily gone another few hours, and I think everyone would have been just as happy. For me, it was a truly one-of-a-kind event, and something I am so glad I got to see. I hope they tape it and air it on PBS or something so everyone else gets a chance to see it. If anyone else who attended reads this, can you please chime in and correct my mistakes, and fill in the blanks where I left things out? FrackleFan2012, WebMistressGina, Borples and 6 others like this. I was in NYC today, but for college stuff, so I couldn't attend. It was INCREDIBLE!!! I was giddy from start to finish. Words cannot describe how fantastic this show was. And, after the show, I met Bill Barretta, Jerry Nelson, and Paul Williams! I just joined the forum so I could read other fans' reviews of the show. (I saw it today at 12:30pm). As I see no other reviews yet, I'll go ahead and give mine. Thank you, Mr. Scott Harris! That was a wonderful review! So glad you joined us. Sounds like it was a once in a lifetime experience! And I think there is something wrong with the ventilation at Carnegie. That has to be the reason my eyes kept watering. Right. That must be it. I was very happy that Emmet Otter was included in the lineup as well as the Fraggles - two of my childhood favorites that I don' t think get as much play as they should. Best part for me was seeing the whole Muppet band at Carnegie. Dr. Teeth, Rowlf, Floyd, Zoot, Janice, and Animal. Also cannot believe that Bob and Susan and Gordon have been on Sesame Street longer than I have been alive. Really a great show, and I cannot believe that tickets were as low as $9. I couldn't even see the new Muppet movie for $9! Carnegie Hall or the Pops series must have some kind of subsidy to keep the price down. I certainly hope this gets put on DVD, but it is notoriously expensive to film at Carnegie so this may have been the only time this plays. Cindy, DannyRWW and Phillip like this. Just got back from the show. It was magic! Let me see if I can remember all of who was there. Kermit, Piggy, Fozzie, Gonzo, Rowlf, Statler, Waldorf, Animal, Dr Teeth, Floyd, Janice, Zoot, Bunsen, Beaker, Beauregard, Mahna Mahna and the Snowths, Traveling Matt, Wembley, Red, Cookie Monster, Bert, Ernie, Elmo, and a number of Emmet Otter characters and people from Sesame Street. The show lasted about an hour and 15 minutes and was top notch from start to finish. So many songs were performed! Cindy and Phillip like this. I was at the 12:30 show, and it was simply amazing. I was not able to attend MuppetFest, back in the early aughts, but this came darn close, with the majority of major performers there. Very surprised Steve Whitmire was not credited anywhere, whether the site or even the handouts we got in the audience. I have to agree about the drawback of audio issues, especially when it came to Gonzo (my favorite Muppet). Uncle Travelling Matt was heard loud and clear, so I'm not sure what the deal was. Speaking of which, it was beyond the normal level of awesome seeing the Fraggles, especially Wembley (my favorite from that crew) live and in person, especially not expecting Steve and since I thought those puppets were supposedly not in good shape, as they've not been in regular use, thus not getting regular repairs/refurbishment. Not sure how, but all 3 looked the same as always. The Emmet Otter creatures definitely looked rebuilt or done from scratch, but I'm not so familiar with them, either. They looked really in too good a shape, or just too different, to be the originals. So much greatness, with so much talent, and I really hope it's just the beginning, with The Muppets making a triumphant comeback, leading to more such things, as well as a home release. I did see the links of the video, which I'm surprised about, since I had a Flip camera, tried to be super inconspicuous (thus not always getting the best view, especially being way in the back), but I was still caught and asked to stop. Either way, I was definitely not going to go posting it online and risk getting into any legal trouble with the entertainers I've enjoyed for so many years. The only other downside, outside of audio issues, is that there wasn't any clear time where I'd be able to meet anybody from the show or be able to afford the meet-and-greet type thing mentioned on this site. I got my The Works out of storage and marked pages in that and the Sesame 40 Years books for everyone there, this morning, but alas, it was for naught. I did get to see a friend from several Muppet events I've been to, so that was nice, and I took along my wife, little brother, and mom, so they all had a great time, as well. Traffic trying to get home was another story. Thanks for hearing my take out, and I hope anyone else who went enjoyed themselves. Borples, Cindy and Phillip like this. I was so happy watching it. I had bad seats, but the performance was excellent. I was so glad Bill Baretta and Steve Whitmire ended up being there (they weren't confirmed on the guest list.) God... I can hardly process it, honestly. I laughed, cried, and all the rest! Also, that little African American kid (can't remember his name at the mo!) who was in the Being Elmo Documentary, and who performed on Sesame, was in the lobby afterwords, trying to get people to take pictures with him. I went to both shows, sixth row up front for the first show and the balcony above Statler and Waldorf for the second show. I could see a lot of the behind the scenes of the Muppeteers performing from the balcony, so that was a neat little change for the second show. The second ran pretty much the same as the first, but the sound issues were fixed, so we actually got to hear Gonzo. The reviews above are great, so rather than a full review I'll just list a few extra items that haven't been mentioned yet. Mahna Mahna and the Snowths performed. The last song in the Sesame medley was I Love Trash, albeit without Oscar. I loved Wembley. He was great. Piggy gave Kermit a little kiss at the end of the second show, didn't notice if that happened in the first show. Animal was a real blink and you'd miss it cameo. He was only on stage for about 5 second. Follow Me was also in the Fraggle segment along with a few small snippets of other songs, Looking at a Fraggle song list, I think they were Wemblin' Fool and Workin' Workin'. Not sure who was handling Beaker, but they did a great job giving him a lot of personality. He got scared whenever the crowd applauded and hid down in his lab coat. It was a cool sight to see from the balcony all of Carnegie Hall doing the hand claps in the Fraggle Rock theme. Cindy, Borples and MrBloogarFoobly like this. Yeah about Wembley! To all those who said that Steve Whitmire was losing his voice, I think we can safely say his upper register is still there.